Gray Skies makes spirits for you to enjoy on your own terms but we hope you visit our distillery. We are always cooking up something new: a house absinthe and brandied cherries for cocktails or new spirits like our Michigan Single Malt Whiskey. In between your visits, subscribe to our newsletter for all the latest happenings at Gray Skies. The Gray Skies tasting room is attached to our production space located at 700 Ottawa NW Grand Rapids, MI. The tasting room is open Tuesday- Thursday from 4 to 11 PM and Friday - Saturday 4 PM - 1 AM. A seasonally revolving menu of cocktails are available to highlight the spirits made onsite. Simple bar snacks are available but this is a space to have a great cocktail, listen to our bartenders Spotify playlists and learn more about where your favorite spirits come from. Spirits from scratch: milled, fermented, distilled and aged on site. 500 gallons at a time. That's how our spirits are made. 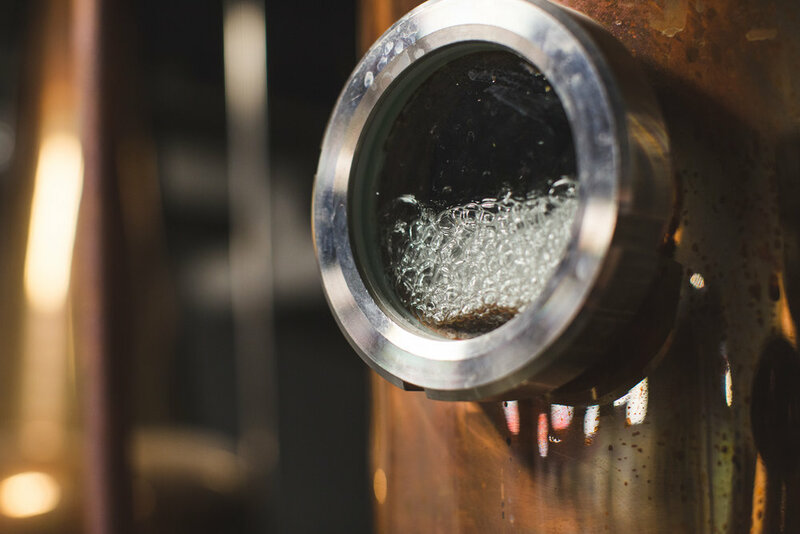 Starting in a mash kettle and ending in a pot still, our small batch method allows us to provide the attention to detail required to craft fine spirits. Our double distillation method creates a smooth but flavorful spirit because whats the point of using the best ingredients if you can't taste them.